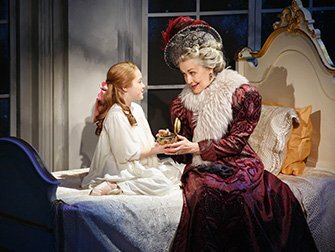 Save on Anastasia on Broadway tickets by buying them before you travel to New York. Buying theatre tickets online is safe and easy and, above all, saves you time and money! Go see this musical about Grand Duchess Anastasia Nikolaevna of Russia in the Broadhurst Theatre. Anastasia on Broadway is a romantic and adventurous show, inspired by the 1997 animated film of the same name. The story opens with the Bolshevik execution of Anastasia’s family. Fast forward to many years later and a rumour is spreading that Anastasia managed to flee the massacre and could still be alive. Two criminals concoct a plan to reap a reward that has been promised by Anastasia’s grandmother. These criminals, Vladimir and Dimitri, begin a search for any girl that they could pass off as the real Anastasia in order to win the reward. They hold an audition where, perchance, they meet and select young Anya. Anya, who suffers from amnesia, seems to everyone, including herself to be a very unlikely match for the real Anastasia. Doubt is raised in all of their minds as to whether she is truly the one they are looking for. Meanwhile, a romance is blossoming between Anya and Dimitri that threatens to thwart the criminals plans to run off with the reward. 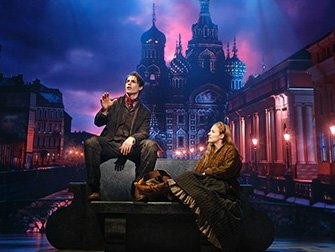 How to buy Anastasia Tickets? It is easy to buy tickets for Anastasia with the link below. I recommend buying tickets online before your trip to New York. Why? A lot of shows are very popular and are often sold out. You’ll also save time and money and most importantly you don’t have to stress about finding tickets when you are in New York. Eric’s Tip: Anastasia is the perfect musical for romantics and lovers of costume drama. The cities of St. Petersburg and Paris are brought to life by impressive video installations and the songs are catchy. There is no violence so it’s perfect for children and young teenagers! Recommended for ages 7 and up. Children up to 4 years aren’t permitted in the theatre.